Three pentagons leave a gap (left) and four overlap (right). 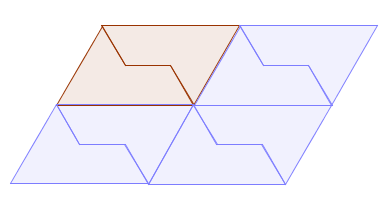 Two pentagons offset against each other (left) don't leave a big enough gap to fit in a third (right). So there's no way to create a tiling. 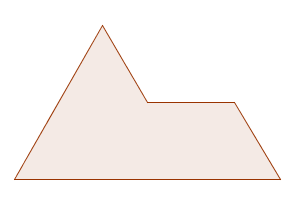 The top pentagon is convex and the bottom one isn't. The obvious thing to do, then, is to allow the pentagon to have sides of different lengths. 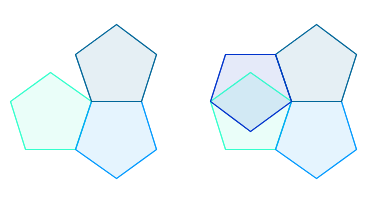 We won't allow it to push its corners inwards though: we only allow convex pentagons (formally, any line connecting two points in the pentagon needs to be contained within the pentagon, see the picture on the left). 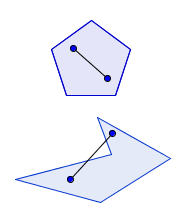 Are there convex, non-regular pentagons that can tile the plane? The new pentagon. Image: Casey Mann. 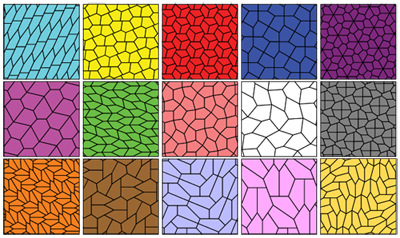 All known tilings by convex pentagons. Image: EdPeggJr. 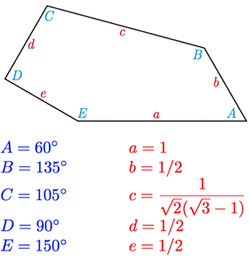 Whether or not the latest addition is the last on the list, or whether there are perhaps infinitely many types of pentagon that tile the plane, nobody knows. 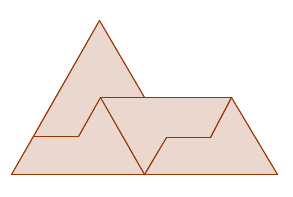 Two sphinxes form a parellelogram with which you can tile the plane. 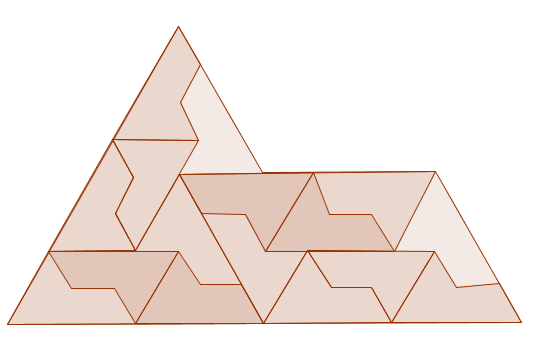 A tiling using the sphinx. Four copies of the sphinx within the sphinx. Now imagine blowing the picture up so that the smaller copies become the size of the larger one. Then fit four copies of the smaller sphinx into each of the four newly-blown-up copies. More copies of the sphinx within the sphinx. You've now created a larger tiling of sphinxes, containing sixteen tiles. Again blow the picture up so that the sixteen smaller copies are the same size as the original copy, and fit four copies into each of those. And so on. Continuing this process, blowing up again and again, you can convince yourself that you can fill every part of the plane with same-sized sphinxes. Another thing that's great about this sphinx tiling is that it's not periodic. The familiar tilings of the plane, say by squares or hexagons, are periodic in the sense that you could pick the whole pattern up, shift it along in a certain direction by a certain distance, then put it down again, and get exactly the same picture as before. That's not the case for a tiling by the sphinx (formally, a sphinx tiling is aperiodic). You simply can't shift the pattern along in a way that ends up with a perfect fit between the new and the old picture. Aperiodic tilings have fascinated mathematicians for a long time (see this article) and have even led to a Nobel Prize in Chemistry (see this article). The five-pointed star has five-fold symmetry. All this was about shapes with five sides, but there is also another direction to move in once you have realised that a regular pentagon won't tile the plane. Rather than asking "are there any other five-sided shapes that do?" you can ask "are there any other shapes with five-fold symmetry that do"? The regular pentagon has five-fold symmetry because you can rotate it around its centre point through a fifth of a full circle (72 degrees) and it'll look exactly the same as before. 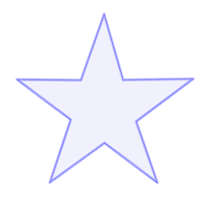 There are other shapes that have the same rotational symmetry, an example is the regular, five-pointed star. So can you tile the plane with shapes that have five-fold symmetry? The answer is that nobody knows: it's an unsolved problem in maths (you can find out more in this article). In terms of tilings, the number five remains trouble.